Acute pancreatitis in pregnancy (APIP) can lead to multiple maternal and fetal organ injury and mitogen-activated protein kinase (MAPK) signaling pathway may be involved in it; however, whether APIP can result in acute lung injury and P38MAPK signaling pathway is involved in the pathogenesis has not been elucidated. The present study was undertaken to investigate the participation of P38MAPK signaling pathway and the protective effect of SB203580, an inhibitor of P38MAPK on acute lung injury induced by APIP. Twenty-four late-gestation SD rats were randomly assigned to four groups: Sham operation (SO) group, SB302580 (SB) group, APIP group, and SB + APIP group. All the rats were killed 6 h after modeling. The severity of pancreatitis was evaluated by serum amylase (AMY) and lipase (LIPA) and histopathological changes. Histological assessment of the lung and inflammatory cell infiltration was performed by H&E and immunofluorescence assay. The lung wet/dry (W/D) weight ratio was determined, and the levels of tumor necrosis factor-α (TNF-α), interleukin (IL)-1β, and IL-6 were detected by enzyme-linked immunosorbent assay (ELISA). Western blot analysis was used to detect the protein expression of phosphorylated and total P38, tumor necrosis factor (TNF)-α, and intercellular adhesion molecules 1 (ICAM-1) in lung tissues. Obvious pathological changes existed in pancreas and lung after the induction of APIP, and their pathological scores were significantly higher than that of control group. The results showed that the phosphorylation of P38MAPK was elevated in the lung of APIP rats. 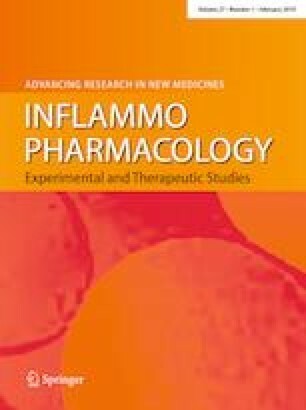 Compared with APIP group, the intervention of SB203580 alleviated the pathological injury of the pancreas and lungs, decreased serum AMY and LIPA, attenuated the secretion of TNF-α, IL-1β, and IL-6 in lung, reduced the inflammatory cells’ infiltration and lung W/D ratio and inhibited the activation of P38MAPK signaling pathway. These results suggest that APIP can lead to acute lung injury and inflammation and SB203580 can inhibit the lung injury by inhibiting the P38MAPK signaling pathway and blocking the inflammatory responses. The authors are grateful to the Central Laboratory, Hubei Key Laboratory of Digestive System Disease of Renmin Hospital of Wuhan University for providing relevant experimental facilities and technical support. This work was supported by the National Natural Science Foundation of China (No.81370562 and 81700567). The study was approved by the Ethics Committee of Renmin Hospital of Wuhan University (No. WDRM-20150606) and performed in compliance with the ARRIVE guidelines.